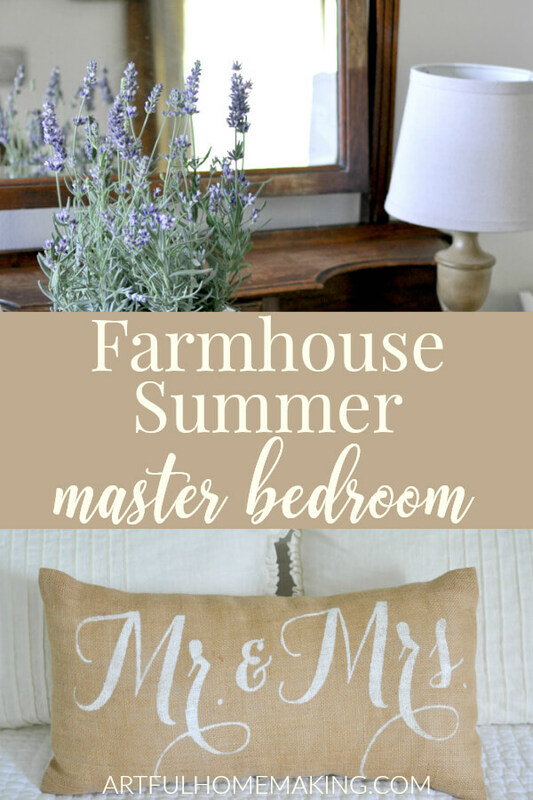 Farmhouse summer bedroom tour with a few simple and peaceful summer decor updates. 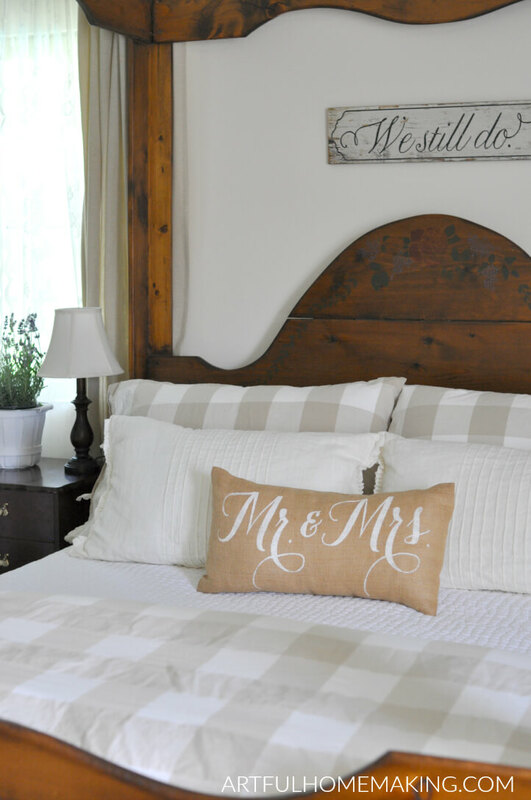 It’s been awhile since I did a home decor post, so I thought I’d take you on a small tour of our master bedroom. 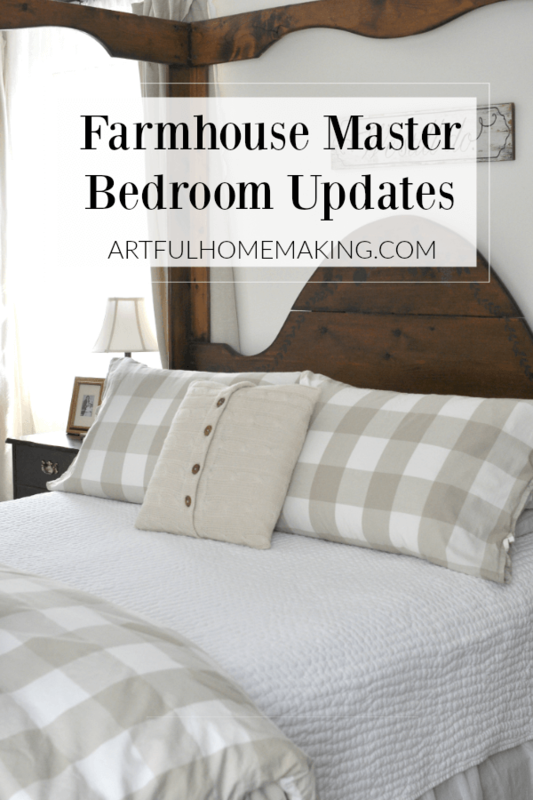 Last year I was able to make a few master bedroom updates (which I shared here), including a new duvet cover, and a new quilt. Not much has changed in our master bedroom other than the addition of a few pillow covers and a beautiful fresh lavender plant (that will probably find its way outside to my herb garden soon). 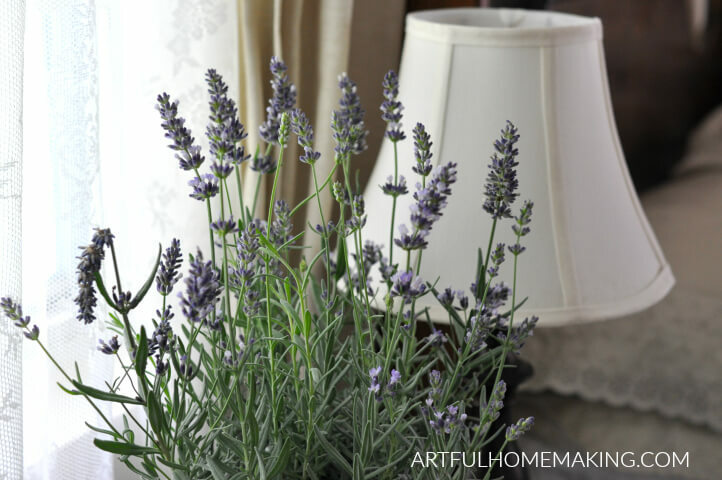 Lavender is my favorite herb, so I love having it in my garden and also in the house. As I’ve mentioned before, my husband bought this bed as a wedding present for me (20 years ago). It’s kind of a family heirloom by now, but I’m still considering painting it white. I know it’s taking me a long time to make up my mind about that, but I want to be really sure it’s a good idea before I take the plunge and grab the paintbrush! We have a very small bedroom, and I think painting the bed frame white would make the room appear bigger and lighter. I’ve never cared much for the stenciling on the headboard, so I wouldn’t be sad to lose it. Nothing is really new in this room, but I realized I hadn’t shown you my Ikea pillow covers and my “mr. 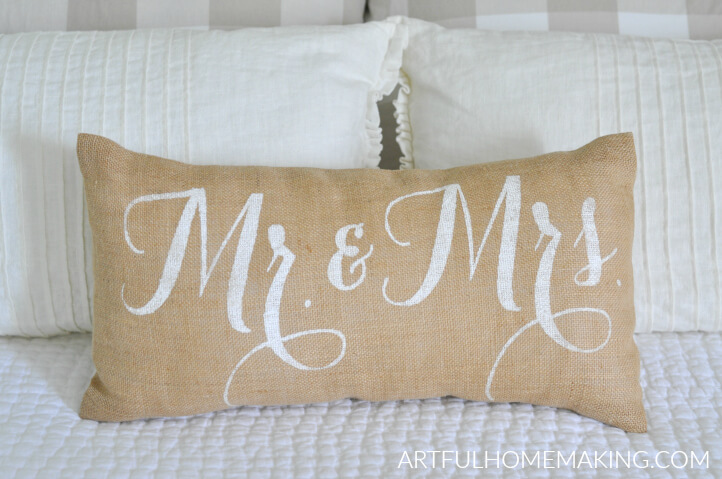 and mrs.” burlap pillow. They’ve been here since last spring, but I hadn’t shared them yet. I love the linen-look and the pleats on these Ikea pillows. The burlap pillow is also a favorite. It seems to go well with the “we still do” sign above our bed. The antique dresser below has been with us for many years. My mom and I found it at a yard sale almost 30 years ago, and I’ve had it in my room ever since. I love how classic it is, and I love the stain on the wood. There’s a companion dresser that came with it, and right now it’s in our living room. I found the lamp on a Walmart clearance for a few dollars, and the linen-look shade is also from Walmart. The white dish on the dresser holds shells collected during a trip to Florida a couple summers ago. Even though this room is small, I love how sunny and cheerful it is. Almost 8 years ago when we moved here, the walls were a dark navy blue. I chose to repaint it in a light neutral color and it made the room look so much bigger and brighter. 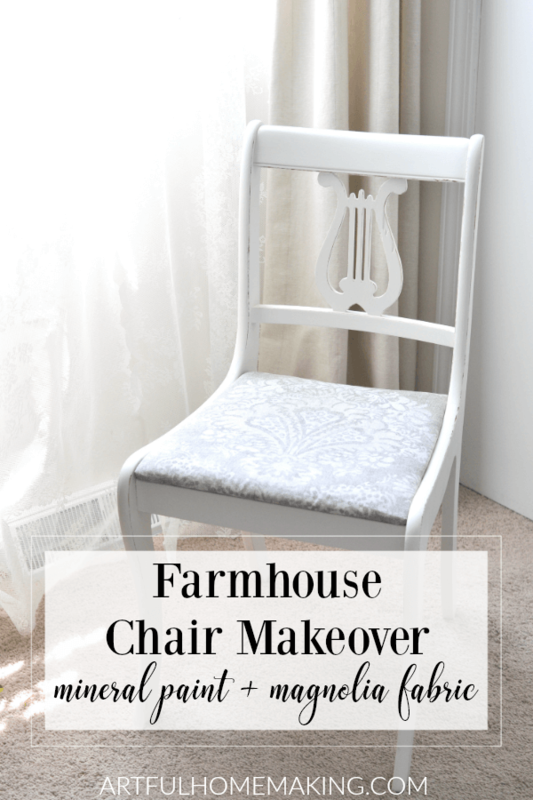 That’s it for our farmhouse summer bedroom tour! Thanks so much for stopping by! We Still Do sign (Ever Thine Home) This one is similar and hand painted (mine isn’t). So dreamy! I LOVE your headboard, it’s gorgeous! Everything is so calming. Thanks for sharing on Homestead Blog Hop! So pretty and fresh! 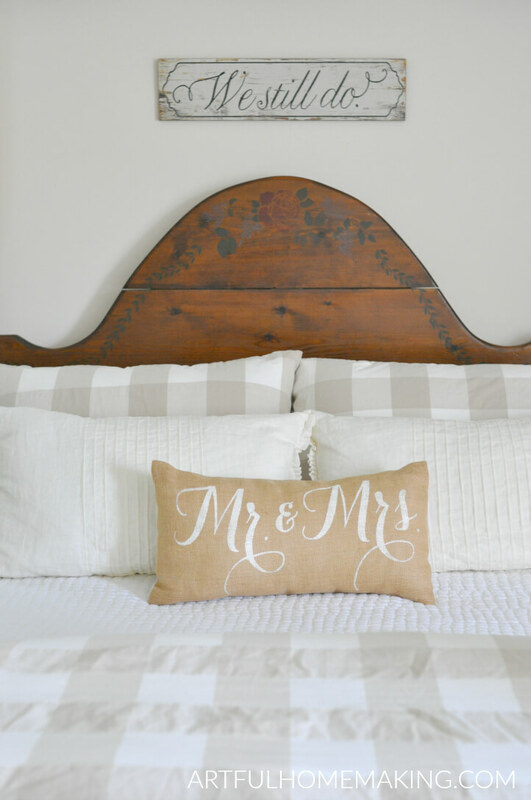 If you don’t want to paint the whole headboard, you could carefully paint a white border that matches that lovely curve. It would give a fresh “pop” without hiding that beautiful wood. Just an idea! 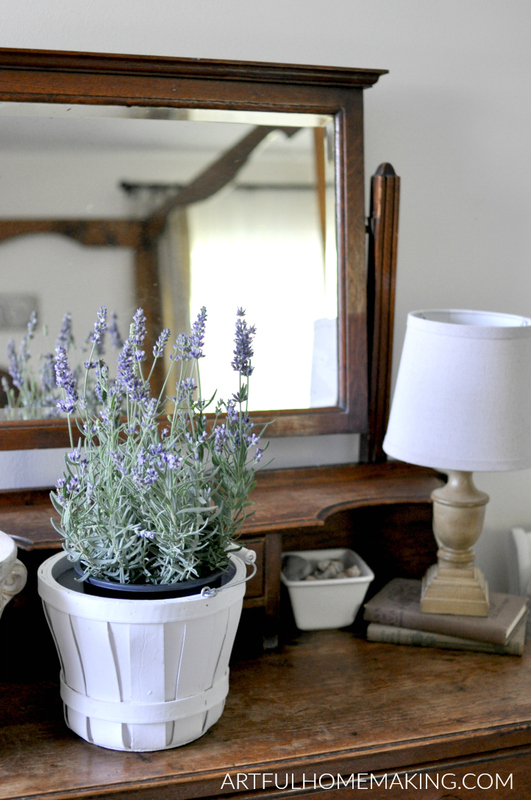 Your room is so peaceful – love the Ikea pillows and the lavender plant. I smiled when I read your dilemma about painting your wood bed white. I have the same dilemma, only I have a white bed that I am considering stripping down to the bare wood. Lately I have been loving all things gray, white and wood. Thank you, Liz! I probably wouldn’t consider painting my bed if it weren’t for the stenciling on it. I love the bare wood look. I’m drawn to gray, white and wood also! 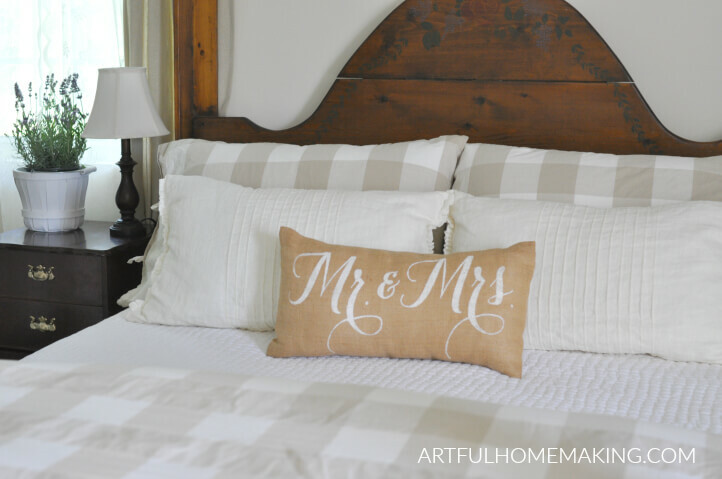 I really like the linen looking pillow cases. So pretty. Lavender is one of my favorites too. So pretty! I love the “We Still Do” sign too! That is just great! 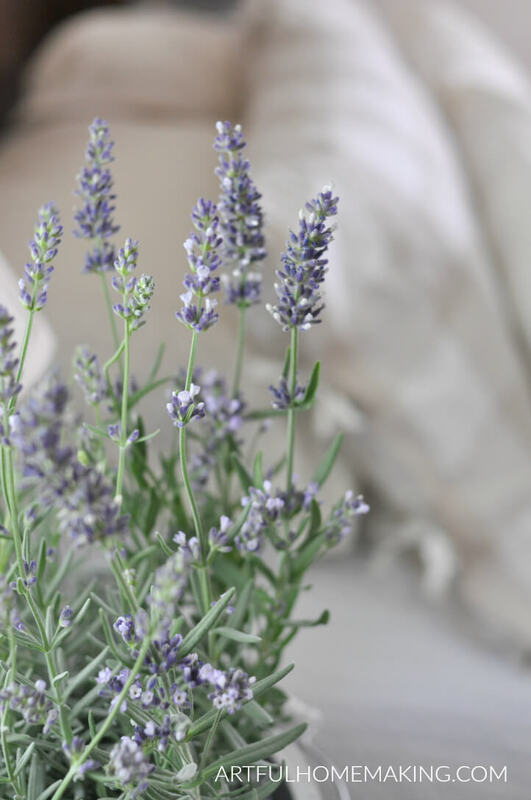 Does the lavender have fragrance? It is a beautiful and delicate plant. Thank you! Yes, the lavender smells lovely. It’s one of my favorites. Beautiful room. I love the dresser and the “We still do” sign! Pinning.